There is just one thing that I can definitively say the U.S. is better at than Canada at this year’s World Junior Championship. Goaltending. At this event in the past, goaltending has sometimes been the downfall of the United States. Not anymore. Certainly not this year. Team USA has a seasoned veteran. A player that has more gold around his neck than Mr. T. A player that has never known what it’s like to finish second in IIHF events. That player is Jack Campbell. If the U.S. is going to have any chance at gold, Campbell needs to continue the trend, not necessarily rise to the occasion. Campbell has already had success. He knows what it takes to win gold and he knows how to prepare. If he keeps it simple and plays the way he’s capable, tonight could potentially further add to the Jack Campbell mystique. On the other end of the ice, Canada will look to Mark Visentin, which doesn’t evoke a lot of confidence. Visentin will have to probably play mistake-free hockey for the Canadians to win tonight. He’s certainly capable, but there’s no doubt the guy that anyone would want to have in a game as big as this is Campbell. By a country mile. The Canadians will run into the best netminder they’ve played in the tournament and its a goaltender that has had success against Canadian teams. Campbell has faced off against Canadian teams four other times in IIHF competition. 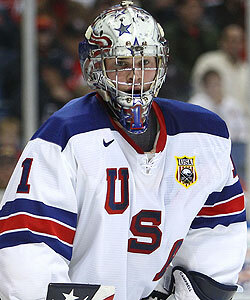 The first was at the 2009 IIHF World Under-18 Championship in… the semifinals on home soil (Fargo, N.D.). In front of a loud, pro-American audience, Campbell made countless highlight reel stops to help the Americans earn a 2-1 win. Last year at the WJC, he met Canada in the prelims and lost in a shootout. Despite the heartbreak of losing the game, Campbell remained ready. When called upon in the gold-medal game, he made key save after key save. When Jordan Eberle netted the two late goals, lesser goaltenders would have probably crumbled, but Campbell bounced back beautifully. Don’t forget that it was his pad save on Alex Pietrangelo that bounced right to John Ramage, who then sprung John Carlson on his golden 2-on-1. Campbell also played a Canadian squad that included guys like Erik Gudbranson at the 2010 World U18 Championship in Belarus, and shut them out, 5-0. Lifetime record: 2-1-1-0 (W-OTW-OTL-L). Maple leaf intimidation? None present with Jack Campbell. His experience at the U18 and World Junior levels give him an advantage. He’s been on the international stage and has yet to finish second. That breeds confidence. On top of Campbell’s success against Canada, he’s got ridiculous numbers in these tournaments. He is also this year’s top goaltender statistically, with a 3-1-0-0 record, 1.03 GAA and .957 save percentage. How does he keep performing like this in World Championships? It’s just in his DNA. He was built for tournaments like these and games like these. It’s why I think he will have success in the NHL. The lights are bright, people are watching and he’s performing. While I was at the NTDP in Ann Arbor, I think we all knew Jack was a special breed. He wasn’t like the other kids. He was youthful, but mature. A supremely confident young man, but one that really cared for his teammates above all. He wanted to win for them. He was about the most competitive, focused athlete I’d ever seen. Well prepared for every game. Knowledgeable about every opponent and tendencies. Technically sound. Athletic. If Jack Campbell was at the top of his game, his team could play in front of him with all of the confidence in the world. When a team has a good goalie, they can be loose. They can be confident. They can worry only about what THEY have to do. No need to worry about the guy with the pillows on his legs. Defensemen know that if they have a misstep, they have a bit of a safety net (no, I’m not encouraging that). Coaches can make a game plan that’s more aggressive, allowing the forwards to take more chances and let the D jump into the play more. It’s that X-factor that makes good teams, great. Jack Campbell is one of a kind. I’m just glad he’s on our side. Coming up a little later today: A look at what Team USA needs to do to win tonight’s hockey game. This entry was posted in 2011 WJC, American Prospects, NTDP, U.S. National Teams. Bookmark the permalink.